The beauty of our compression calf sleeves is three-fold. First, they offer many of the same feel-good features as our over-the-calf socks, like true graduated compression, moisture control and muscle support. Second, you get to mix-and-match them with different socks for all your different activities. And third, we think you'll agree, they just look great. STAY ENERGIZED : True graduated compression of mmHg 22-26 (Millimeter of Mercury, unit for pressure) for the right pressure in the right spots. Increase your blood flow to reduce inflammation and muscle fatigue. RECOVER FASTER : Healthy blood flow helps repair broken down soft tissue quicker which shortens your recovery time so you can feel great for the day ahead. SUPPORT WHERE YOU NEED IT MOST : Our calf-sleeves are made of 92% Nylon and 8% Lycra Spandex which are the foundation for their ability to wick away sweat to keep you dry. FIRST CLASS EXPERIENCE : We design and manufacture all our styles locally in the USA to ensure 100% quality control, on time shipping and attention to detail so every pair meets your standards. GREAT ALTERNATIVE TO FULL COMPRESSION SOCKS : Already found your favorite sock? No problem! You can wear our calf sleeves with every sock and still enjoy the benefits of full graduated compression. Reap the Benefits of Compression in a Flexible Style! Whether you’re going for a jog or getting ready for a long day at work, the PRO Compression Calf Sleeve is an ideal alternative to a traditional compression sock. Pair with any of your favorite low-profile socks for full flexibility! Win Against the Day with Graduated Compression. Compression, if you don't know already, is incredible for your health and wellness. Haven't experienced how it can revolutionize your day yet? Give this style a try. Comfort is Our Top Priority! When it comes to getting through a long run or a long day, it all comes down to comfort. Are you feeling good when you've reached the finish line? 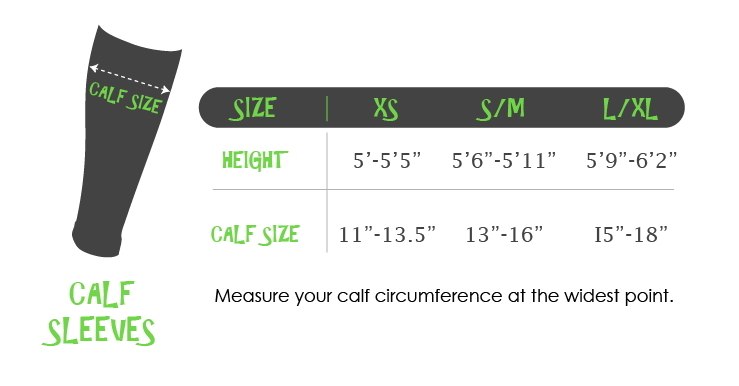 PRO Compression's technology ensures that through advanced contouring design and graduated compression from your ankle to the top of your calf. It's all in the threads : Our proprietary blend of materials provides all-over moisture control, while our advanced construction supports your critical muscles. All of our calf sleeves are proudly made in the U.S.A.